Family-owned and operated hardware store, Burdette’s Hardware, relocates to Fountain Inn while Pack Steel takes ownership of previous building in Simpsonville. In 1899, B. W. Burdette And Son Hardware opened in Simpsonville. The business has been a town staple for home improvement or contractor projects since wagons were still on roads. Multiple generations of locals have shopped there for maintenance supplies (plumbing and electrical), tools, nuts, bolts, and lawn and gardening products. Once the McCraw family took ownership in 1986, the offerings and services have expanded leaving a new legacy behind. Alan and Art McCraw are brothers who bought the original store in November 1985 on Curtis Street. 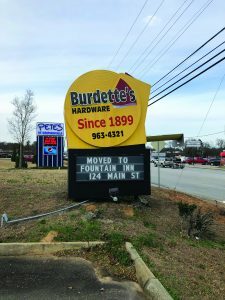 To utilize more space and be more centrally located, Burdette’s Hardware moved to 805 NE Main Street in Simpsonville in 1920. Last year, Art decided he wanted to focus on his mission work at White Horse Missions. To better serve locals and the country of Honduras with medical aid, he needed to carve more time in his day. Alan’s son, Connor, came to the rescue and bought out Burdette’s Hardware store from his family members. For Connor, it’s really about keeping the community supplied with everything they need, “I’ve done this since I was a kid. To be able to help someone with a problem and better serve everyone out of one spot is why we got into it,” he says. Other hardware stores haven’t been passed down the bloodline, so they may not have as much as experience as staff at Burdette’s. Connor emphasizes what sets them apart, “Our customer service and knowledge is above par compared to anyone else. We hire experts out of the field.” Additionally, he explains, “We at Burdette’s Hardware are not tied down to any single supplier. 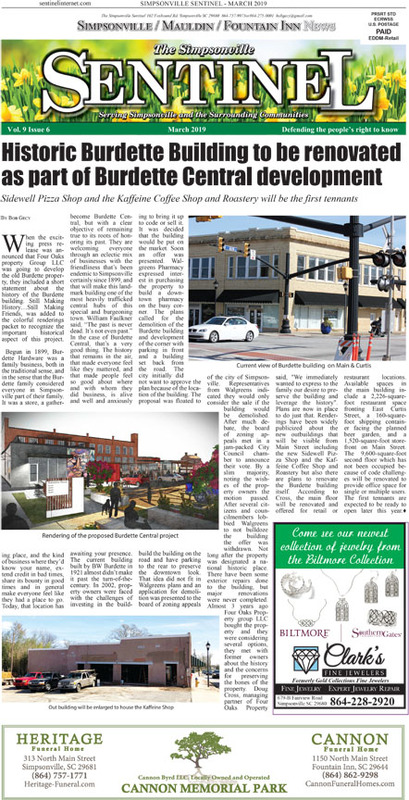 We can buy from anyone we choose to offer a better variety of products to our customers.” To celebrate the new building location, Connor plans to have a grand reopening towards the end of March. During the transition, Alan McCraw decided to transform the former Burdette’s Hardware building into a new endeavor called Pack Steel. Alan and his family members saw a need in the community, “We are filling a gap that was there. It blew up beyond what we had imagined. We’re here to service customers.” Burdette’s Hardware store had always sold steel and iron, “I always thought it was something we could expand on,” Alan says. Pack Steel operated out of the back of Burdette’s for two and a half years before becoming it’s own building. Alan explains what they offer, “We sell limited hardware. We do all kinds of iron, stainless steel, aluminum, carbon steel, w-d 40, duct tape and welding supplies.” Anyone can benefit from a visit including builders, industrial trucks, commercial, farmers, contractors or individuals. Pack Steel can deliver materials and supply any amount, “There’s no $1000 dollar or $1,000 materials minimum. We’ll sell whatever you need,” Alan shares.